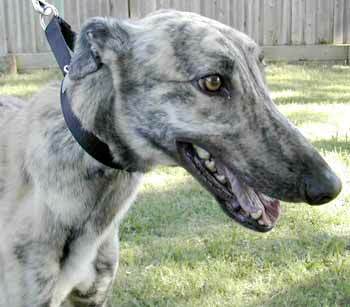 Nick, aka DOX Lemon Design, is quite striking with his lemon brindle coloring. He and Jake are brothers, born April 25, 2000, and Nick is a real love. Both boys are from the DOX Kennels, and their dam was DOX Lemon Chick, out of FMC's Wake Up, and sire was Class by Design. Nick was sent off to school last November, and after graduation, was at the Corpus Christi track, where his timing was one of the slower greys.....lucky for some waiting family! Nick will be a wonderful addition as a companion pet. The best way to describe Nick is to say this is a dog who loves life. 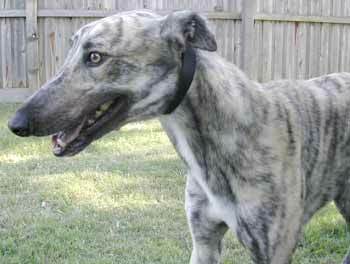 Nick loves people, loves greyhounds, loves toys, loves walks, and loves to eat. His tail is always wagging and he smiles as if he is in on a good joke. Any Jimmy Buffet fans out there? Well Nick's ears remind me of the lyrics "fins to the left, fins to the right..." because those ears go in all directions! Nick is a very sweet, mild-mannered guy with a lot of love to give his forever family. Get ready to spend hours scratching those crazy ears as he lays his head in your lap.